There are a lot of businesses with the same logo, name, or brand and even sell the same products and services. They have little differences, which help us choose which one we prefer most. We would say that we like the food in this branch compared to the food in the mall branch. They may carry the same name and provide the same products and services, but most of these businesses are owned by different people. This is made possible through franchising. We will be presenting you with contract samples about franchising agreements as well as the things that you need to know if you plan on franchising a particular business. These samples are made available in PDF so that you will be able to easily and conveniently download them. You may edit these samples and use them as your own or you can use them as reference when you make your own franchise contract. You can check the samples below. What Is Meant by a Franchise? You have heard of this word a lot of times, whether on TV, on the radio, and even on social media. 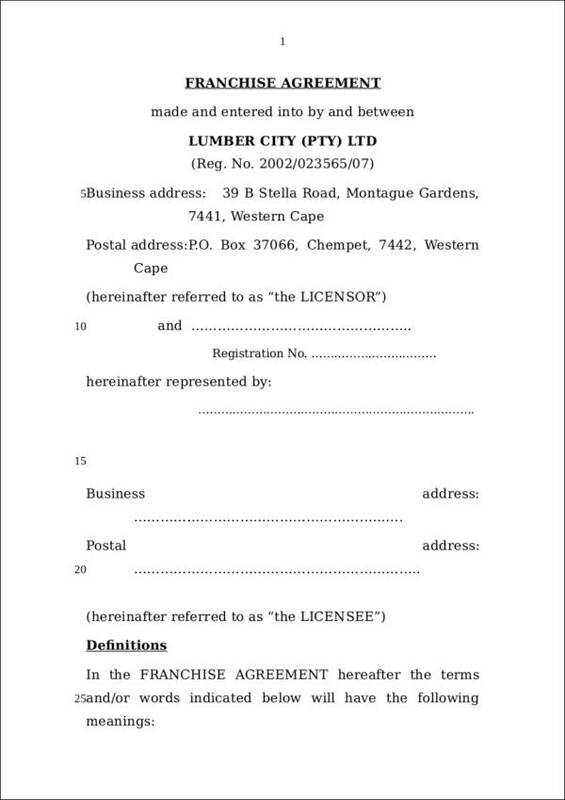 A franchise allows one party to have rights or access to a certain business. It is like a permission or a license given to a party who wants to use the name, logo, and trademark of a business, as well as sell their products and services. This is how a lot of businesses have been appearing near your area or in places where they have not been before. Businesses expand their business through franchising and it is proven to be very effective, especially if the party who wishes to franchise is capable of handling the business. What Is a Franchise Contract? 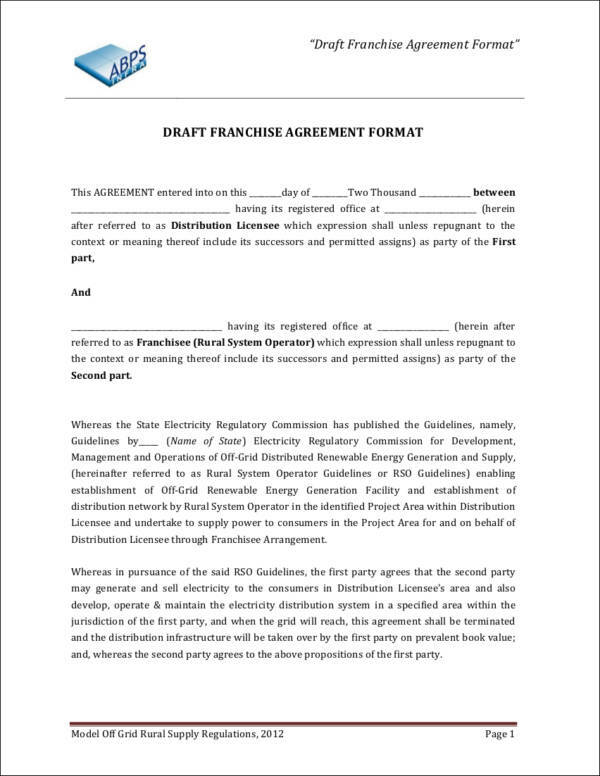 A franchise contract or a franchise agreement is an arrangement that takes place between the owner of the business or franchiser and the party who wants to franchise the business. It is a legal contract that is enforceable in the court of law. 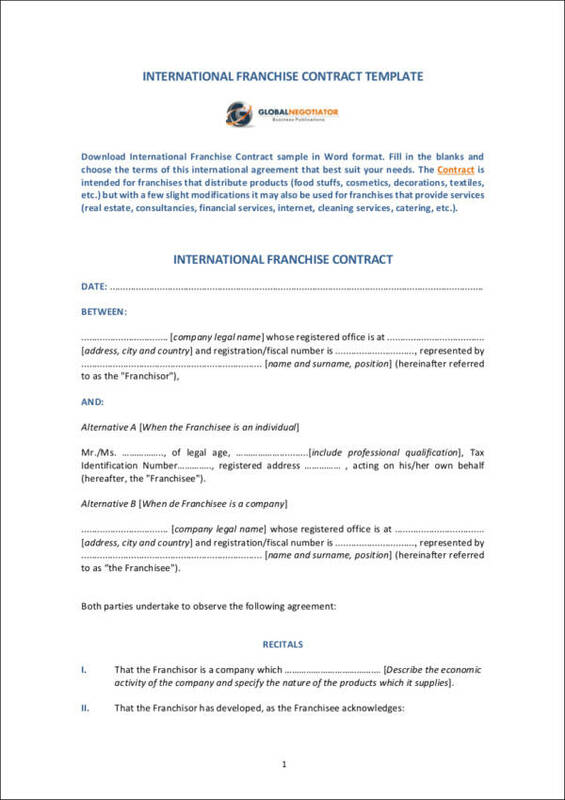 There are different laws regulating a franchise contract in different countries. In the United States, this contract is being regulated by the Federal Trade Commission. 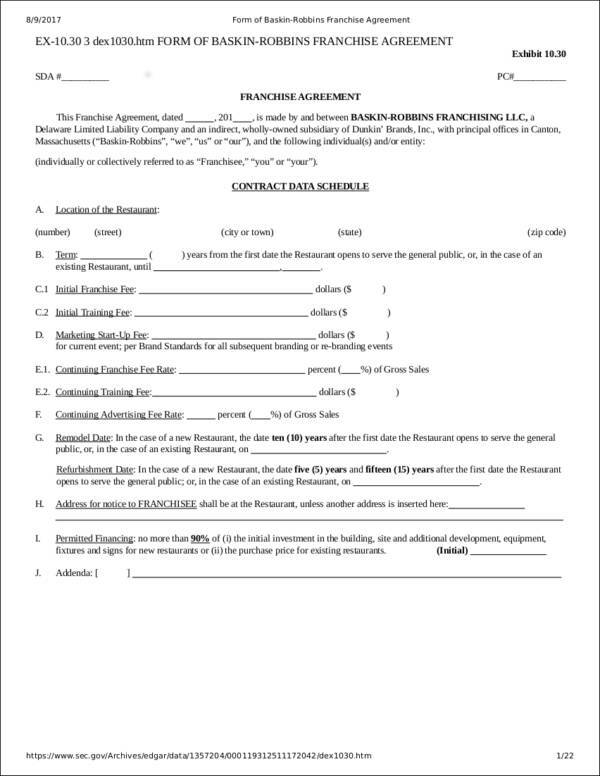 A franchise disclosure document should be presented to the franchisee before they sign the franchise contract. 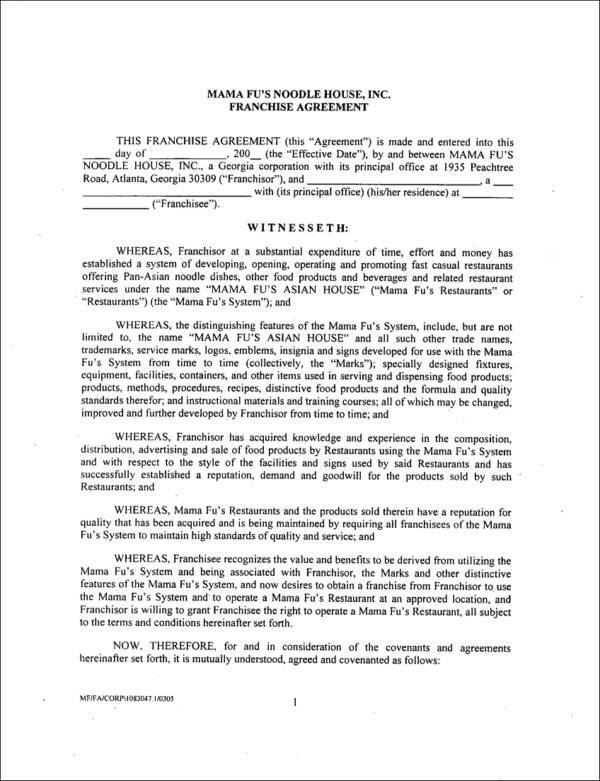 A franchise contract serves as a document that gives permission to a franchisee to be able to use the name and logo and sell the products and services of the said business. They are also given access to the business’s proprietary information, business secrets, business processes, and many more. 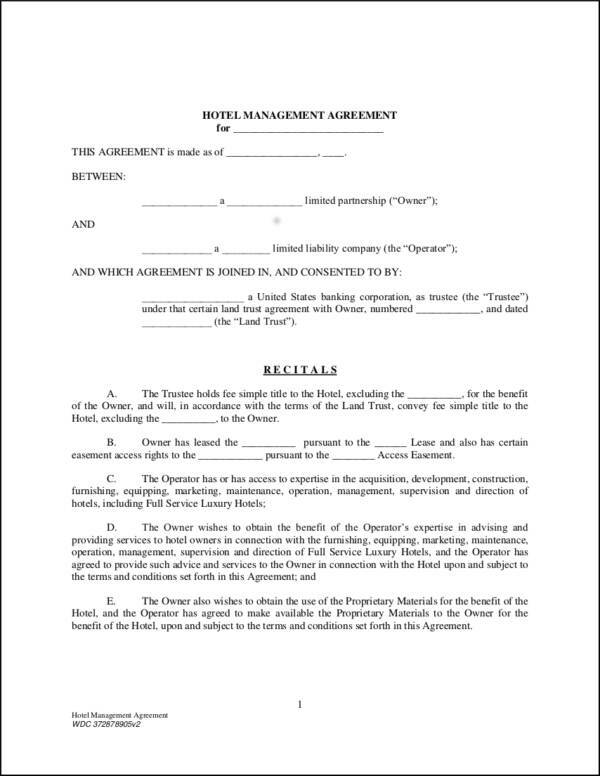 The contract also provides an outline of the obligations of both parties with regard to the said business. 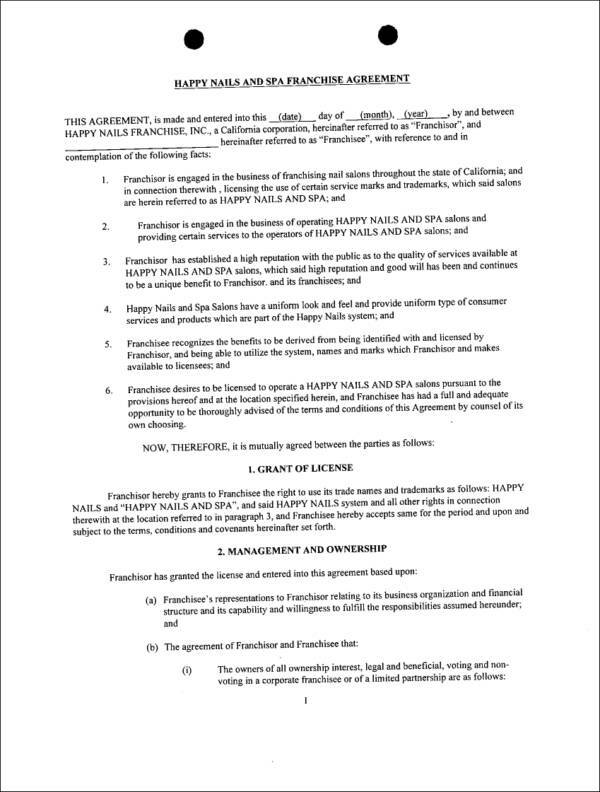 This contract is sealed when both franchiser and franchisee come into agreement with the terms and conditions of the contract. Like all other legal contracts, any violation is subject to legal consequences. 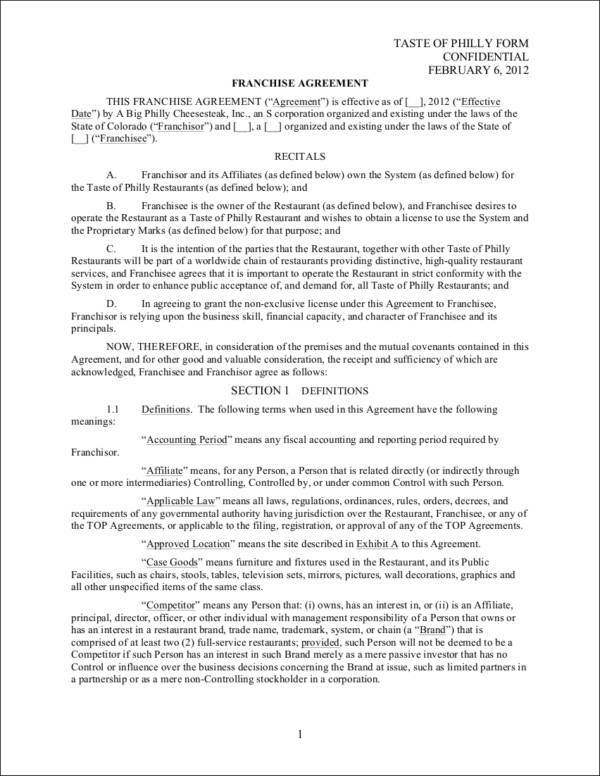 A franchise disclosure document or FDD is a legal document that is used in the United States specifically for franchising businesses. 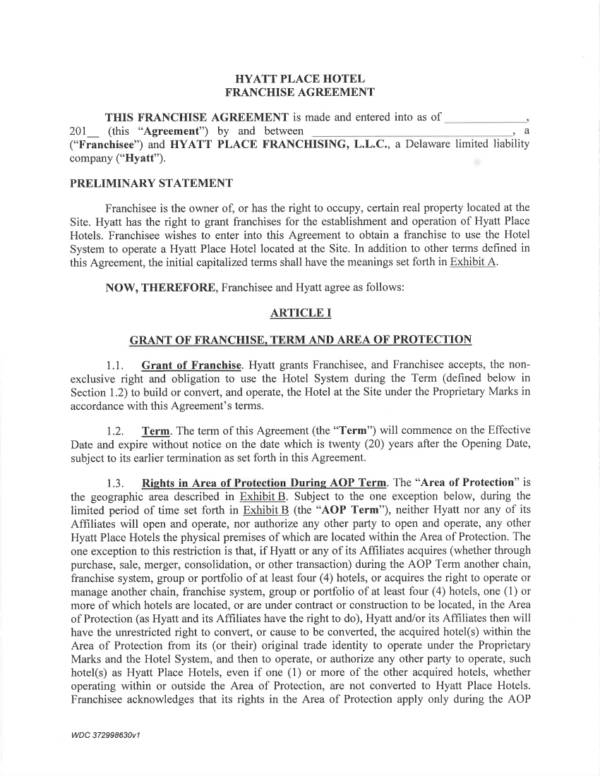 In the pre-selling process, the prospective franchisee of any business is presented with the franchise disclosure document exactly 14 days before they agree to sign the franchise contract. The Federal Trade Commission is the government body that regulates the franchising industry in the United States. 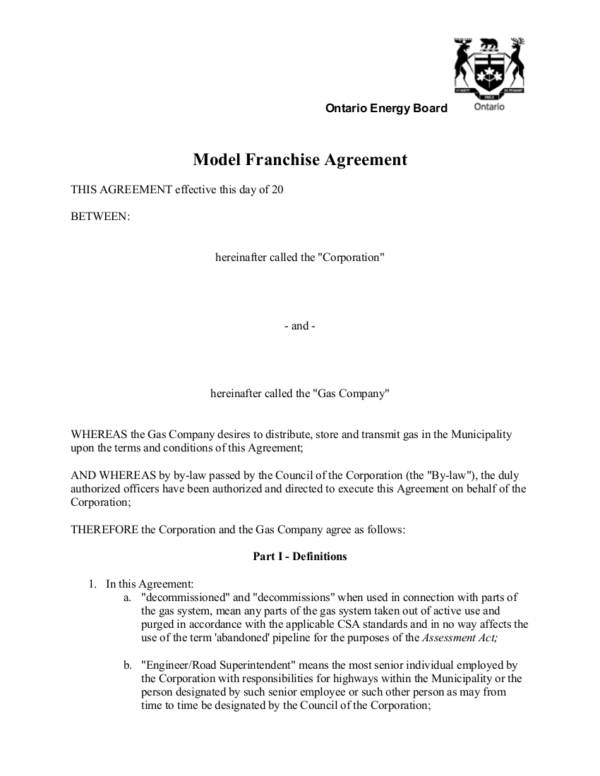 Specific obligations about the franchise are being disclosed in the franchise disclosure document. 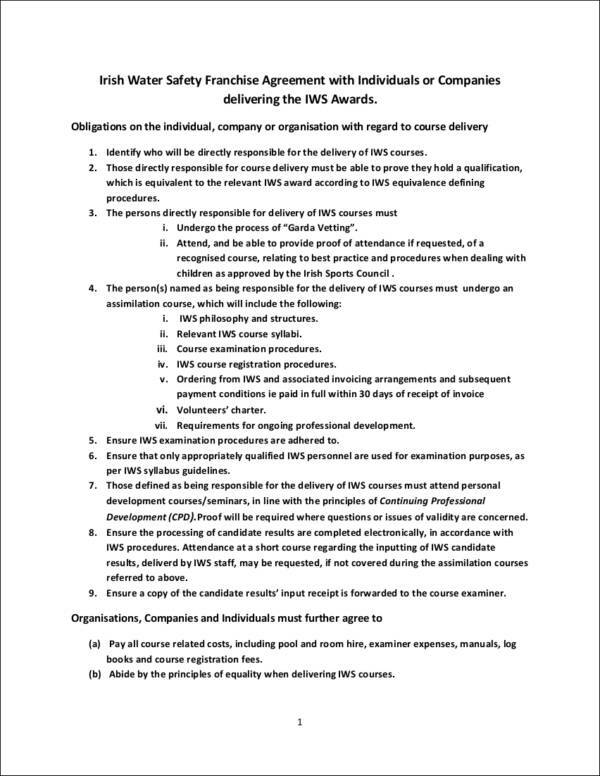 These obligations include the people who are responsible for preparing the disclosure, who will have the disclosures furnished, how will the franchisee receive the furnished disclosure, and the length of time that the franchisee needs to be able to review the disclosure. Instead of starting their own business, people would prefer franchising businesses, especially those that are already famous and have built their own names. It is said that franchising is easier and more stable than starting from scratch. This is actually true. Most brands and businesses have already made their own names and people already know if they are good or bad. Here we will be providing you with the benefits that you can get from getting into a franchise contract. A franchise contract gives you a feeling of security. Being a legal transaction that is supported by a legal document and legal processes, you are sure that the franchiser you will be doing business with can be trusted and you can get back whatever amount of money you have spent in the event that they did something wrong. You can guarantee that your business partner will be trustworthy as they have already established a good name and reputation. Doing fraudulent acts or unlawful acts will make them look bad. If that happens, then they will lose face and lose their business. 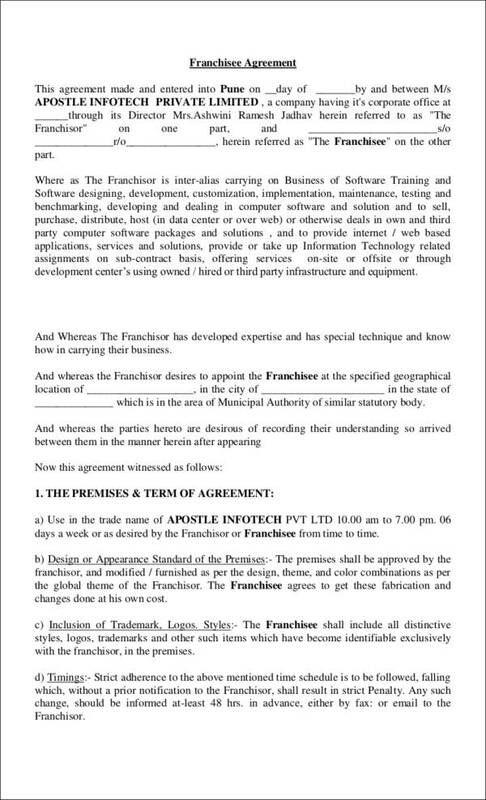 A franchise contract outlines both the franchiser and the franchisee’s obligations that are related to the said contract. It will serve as a guide for both parties on the things that they can and cannot do, which ultimately saves them from any violations or breach. Getting into a franchise contract ensures that you are getting yourself into a business contract that is sure to survive the tests of time. Of course, you need to work hard and have knowledge about it in order to run the business properly and successfully. In a franchise contract, the franchiser will be the one to provide you with everything that you need to manage and run the business that you have franchised. You don’t have to worry about where to get this and that, what location to put in, and what products to sell. It will all be provided by the franchiser including trained service crew to attend to your customers. 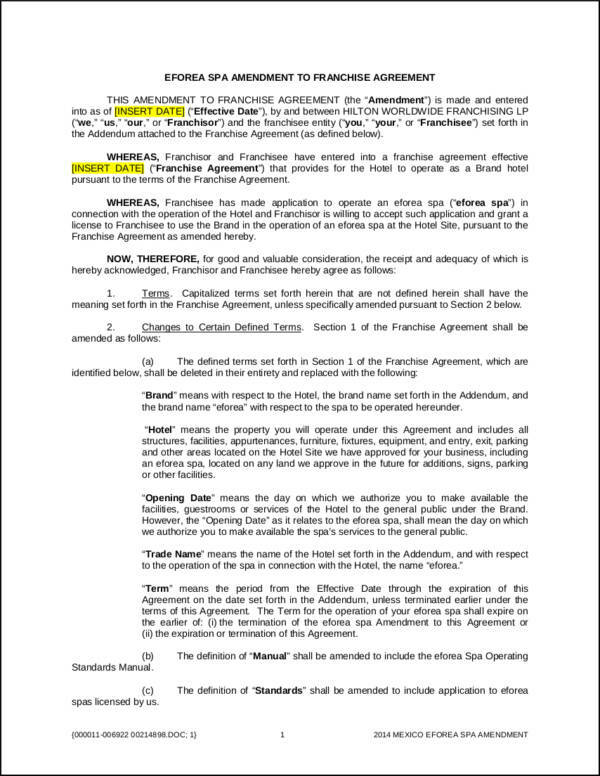 What Is Included in a Franchise Contract? Employment contracts include information that are specific to its use. Rental contracts and lease agreement contracts also include things that are only applicable to rental and leasing businesses. 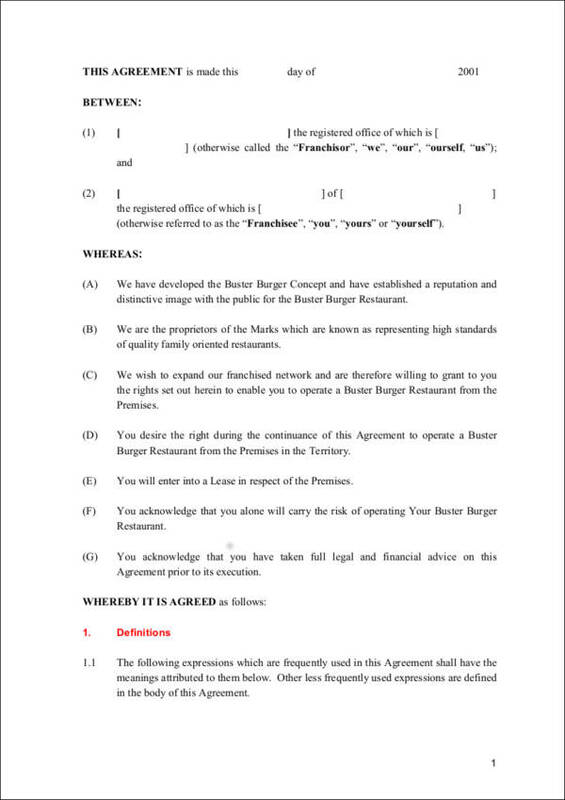 This is done so that the contract can be suitable and useful for the specific transaction it will be used for. The same thing is true with franchise contracts. If you want to get into a franchise contract, then you need to know what it looks like and what is included. That can be achieved by downloading any of the franchise contract samples that we have provided in this article. 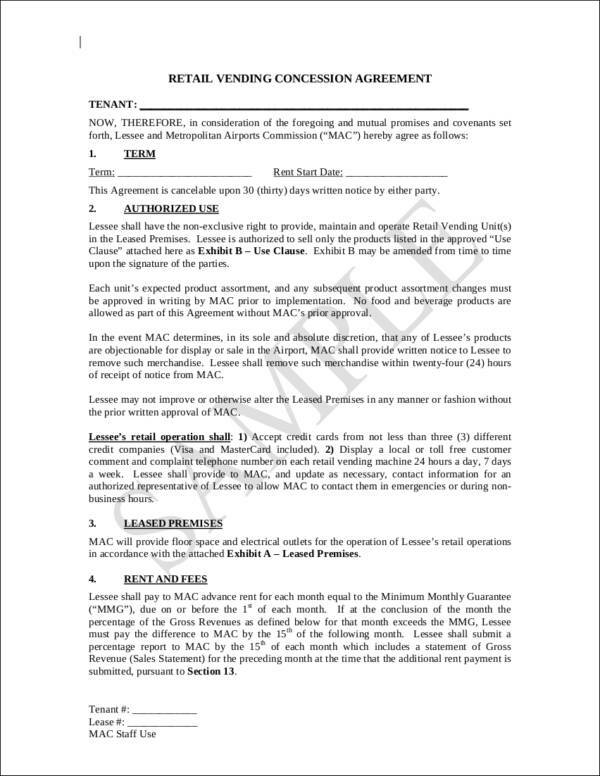 We have also enumerated the things that make up a franchise contract below. 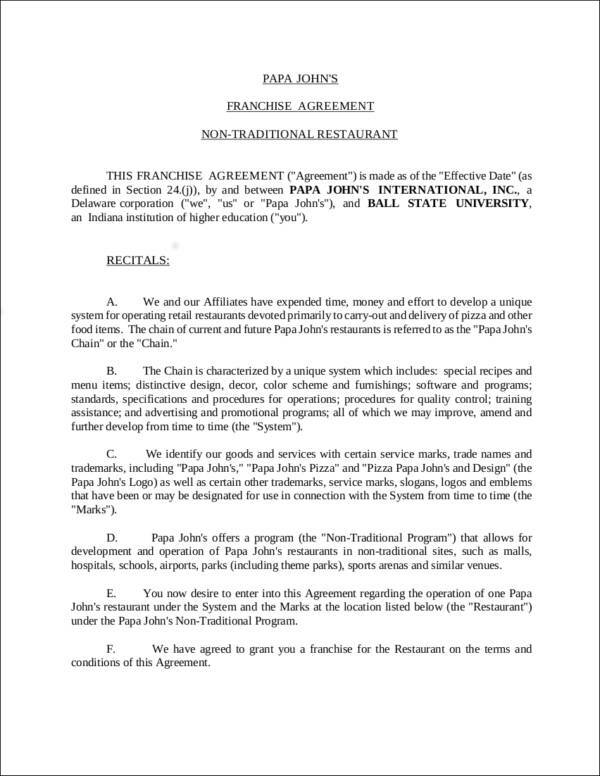 How the franchisee will make the payment, how much they need to pay, the marketing and training fees, royalty fees, transfer fees, etc. Franchising is a good way to have your own business. Many people are attracted by how business is done with the franchising industry. It may be an attractive and convenient way to do business, but it is because it also requires a large sum of money in order to start one. That is why you need to carefully think and analyze a franchise contract before you hold that pen and affix your signature. The things that we have gathered here will definitely tell you of the things that you need to know about franchise contracts. 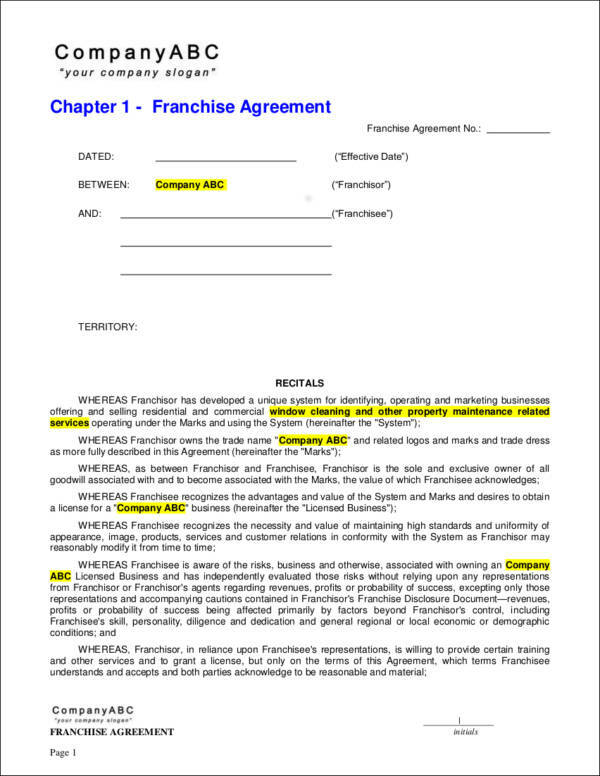 A franchise contract is written from the business or company’s perspective. When you read a franchise contract you will realize that a lot of things are in favor of the franchisor. This is proof that the business you are trying to franchise is a good one. Franchise contracts are usually unilateral in nature, that is why there is more from the franchiser than there is for the franchisee. But it doesn’t mean that the contract is more in favor of the franchiser. There are still equal benefits for both franchiser and franchisee. It’s just that the franchiser has the right to say more or demand certain acts from the franchisee. This is because you will be bringing their name and trademark, and these things mean a lot to their business. A strong franchise company or business have non-negotiable contracts. This may seem so one-sided in your opinion, but it is actually a good sign. It means that the business or company you are trying to franchise is trustworthy. You should not worry about not being able to negotiate because you are not the only one they are doing this to. All of the other franchisee experience the same thing. They do this to maximize the benefits that each franchisee will get from the business. You should accept the fact that the contract is what it is. Everything is made uniform. On the other hand, if the franchise contract you are getting into allows negotiations for the provisions in the contract then you should be alarmed. Take it as a warning sign. We see negotiations as a good thing, especially if we are negotiating about something that is to our advantage. But it is not a good thing in franchise contracts. You need to ask if the business or company would allow you to negotiate the terms and conditions in the franchise contract. If it is a yes, you might want to get a lot of professional advice or be out of the contract. 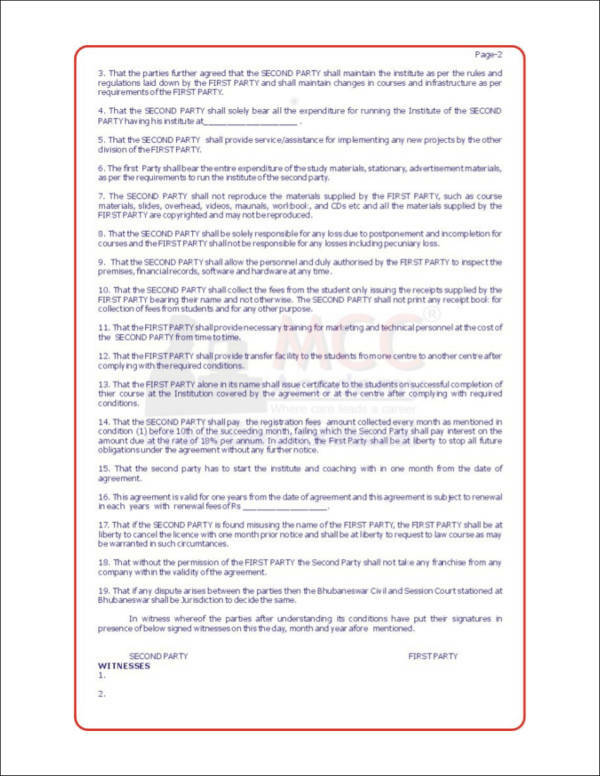 Everything that you must do is stated in the franchise contract. It will provide you with an outline of all the things that you must do that is related to running the business. A franchise contract contains a lot of rules. These rules will help the franchisee understand the business more and will help them make priorities that are beneficial to the business. If there are a lot of things that you must do, a franchise contract is also full of things that you can’t do. These things are mainly done to protect the business. Protect it from what? Since they will be allowing you into their system and giving you access to their proprietary information and trade secrets, the franchiser needs to make sure that you as a franchisee won’t do anything to harm, compete, or leak their business secrets. In addition, the franchise agreement includes a list of the activities that you are restricted to do while the contract is still ongoing. 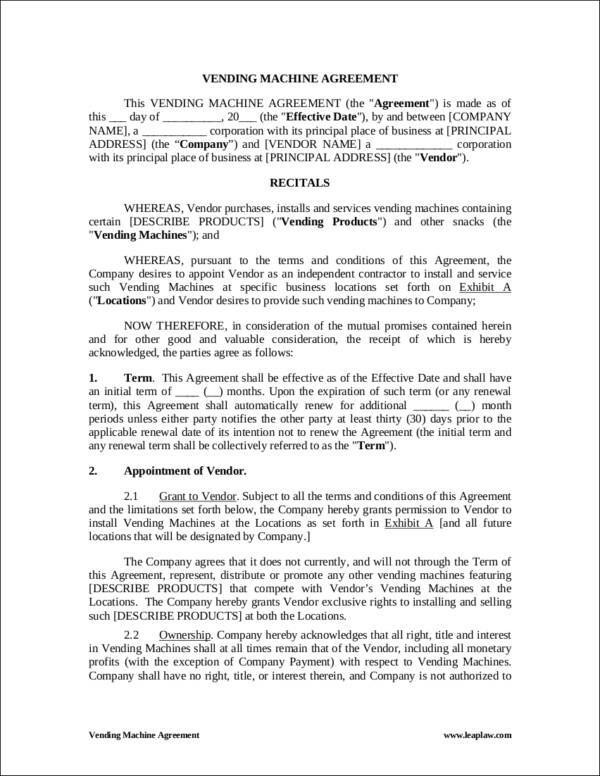 A franchise contract will contain additional terms and conditions that are likely not relevant to the contract but are used to protect the company and to determine its actions in the future. The first time you come across the additional provisions you might find it useless and off topic, but when you understand and get the point on why they are doing it, you will know better about the company and what they will be doing in the future. It may be hard for you to leave or sell the business when you get into a franchise contract. Most franchise contracts last for 10 years up to 20 years, and franchisees tend to leave just before the contract ends. There are a lot of things that you need to consider if you wish to leave or sell the business. There are the termination fees, transfer fees, and other provisions that would require you to pay a lot of fees. There are contracts that you can read and scrutinize on your own and everything would be fine. But when it comes to franchise contracts, you would really need an attorney to do all the reading, understanding, and analyzing for you. Their services are not needed if they can’t handle such things. It is important that you have this done before you even consider signing the franchise contract. Franchising is a good way to expand and get into business. A lot of people just prefer franchising instead of starting their business from scratch. Why not? Franchising has a higher chance of getting into a successful business compared to starting from scratch. With the business name already known and the marketing already laid out for you, what more could you ask for? So what’s the catch? As good and as convenient as it may seem, the price you have to pay for a franchise will never be cheap. Well, you just can’t have everything your way. The franchise fee for a certain business varies depending on its value. You do not only pay the required fee, you should also be able to comply with the needed requirements in order to be considered a franchisee. So we’re done about the good things. It’s now time to tell you about the bad things. This is not to discourage you from buying a franchise or getting involved in a franchise contract but to provide you with both the good and bad about franchise contracts. A franchise contract allows the franchiser or gives the franchiser the power to dictate you on how you should run the business, which is based on their standards. This provides you with very little chance to put your ideas or marketing strategies to work. The franchise contract includes a lot of limitations. These limitations cover the procedures or how you operate the business, what products you can sell in the business, and they also determine the suppliers who will provide you with supplies for your business. A business may have a lot of franchisees, especially those businesses that are really well-known. So if one of the franchisees makes a terrible mistake giving a bad reputation to the business, you will of course be affected by that mistake even if it’s not you who did it. The franchiser earns from your earnings. Simply put, you share your profit with them. That is how the franchising business goes. Although the chances of being successful in franchising a business is high, there is still no guarantee that whoever buys a franchise is successful. The risks of buying a franchise is just like the risks that one takes when starting a business from scratch.